1. Purpose. 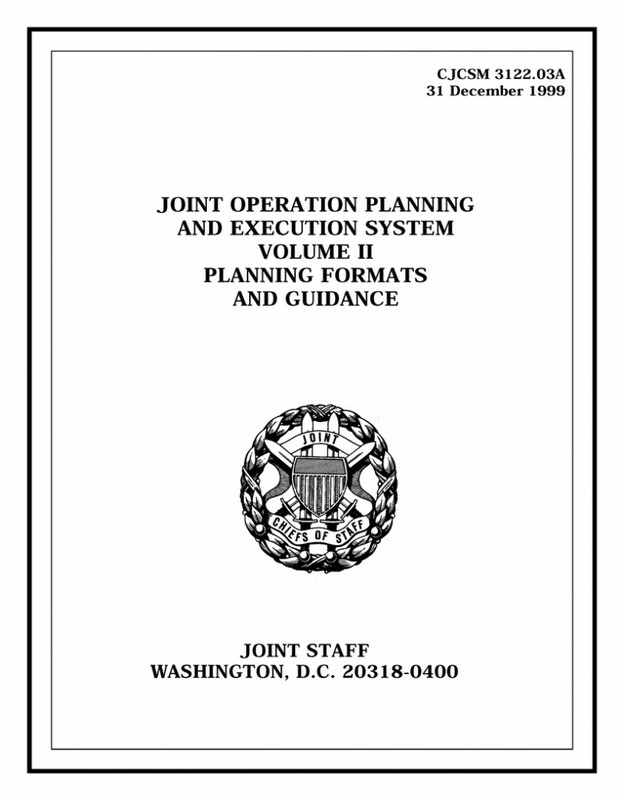 This manual sets forth administrative instructions and formats to govern the development of joint operation plans submitted for review to the Chairman of the Joint Chiefs of Staff (hereafter referred to as “Chairman”). Unless otherwise indicated, the formats and procedures in this document are mandatory for the Joint Staff, all combatant commands, Services, and combat support agencies responsive to the Chairman of the Joint Chiefs of Staff. 1. Purpose. This enclosure provides policy designed to allow a supported command to build TPFDDs for OPLANs and CONPLANs using JOPES ADP in a protected environment by limiting access to the designated newsgroup and TPFDD. Planning Policy and Procedures. Restricted access administrative policies designed to provide the level of planning security required by a supported command are explained in the following paragraphs. 3. Security. A restricted access OPLAN is not necessarily classified differently from any other plan. The initiator of the plan must assign the classification. Some of the procedures for initiating and changing access to a restricted access plan are classified SECRET NOFORN, and should be protected as such. Obtain guidance for protecting such information from current security directives. In instances requiring multinational restricted access planning, supported commands must get permission from the Chairman, using the applicable action to allow non-US planners access. a. General Capabilities. Current policy allows the originator of an OPLAN to limit access of the associated TPFDD by USERID using JOPES ADP. Restricted access procedures are normally initiated at the Concept Development Phase of Deliberate Planning before production of the OPLAN. b. Types of Restricted Access. There are two methods of employing restricted access in JOPES ADP. The first restricts access to selected users at a single, local, JOPES site (Limited Local). The second restricts access to selected users at designated sites authorized by the plan initiator (Limited Network). When the JPEC requires access to the OPLAN, the database is networked to applicable sites for implementation. The network FM (JNOCC) and TDBM should be granted access to all restricted network plans. c. Controlling Access. The most restricted type of restricted access OPLAN is resident at the host site only. Therefore, the only method of reviewing the data by other authorized JOPES users is by database select to the initiator’s site. This requires specific permissions from the initiator. ( ) References: List DOD, CJCS, Service, command, or international directives, plans, or guidance documents specifically referred to in this plan element. pertinent to the foreign data sharing. 1. Purpose. Provide a summary of categories and types of information exchanges, by country, needed to effectively and efficiently execute the plan. Summary must include data provided to foreign countries, data provided from foreign countries and data generated cooperatively by two or more countries. 2. General. Outline the information to be either disclosed to, released to or received from foreign entities and the planned approach, including safe guarding steps to be taken. In addition, if national disclosure policy or other releasability/disclosure authorities are needed, annotate with an outline of how those authorizations will be requested. a. Concept of Foreign Data Sharing Support Operations. Outline specific Foreign Data Sharing requirements, including overall foreign data sharing approach. Outline procedures to prevent unauthorized disclosure and release of classified information on SIPRNET and JWICS. b. Tasks. For each country with which data is to be shared, completion of an entry for each data element in the following chart is required. In subsequent paragraphs, provide approaches to sending, receiving, safeguarding, and utilizing the shared data.